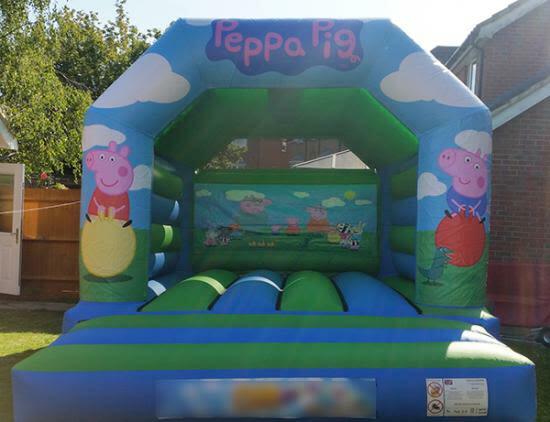 Peppa Pig Bouncy Castle Hire Liverpool, Widnes And St Helens. A celebration is in order, your child is having a birthday and he/she simply loves the Peppa Pig cartoon. You are thinking and thinking and trying to come up with something new and exciting; something that your child will remember for a long time. Introducing the Peppa Pig Bouncy Castle, measuring at 12.5ft x 15.5ft. It is a wonderful inflatable castle for kids. You can have it set up in your own garden, field, or park, and you will need a 18ft x 15ft space to fit it in. Did you know that jumping and bouncing is great for kids? But not only them, it has many positive effects on everybody. Your kids will love it, and their little guests will always tell the other kids that they had the time of their lives at your party. You can hire it for £55, and if you wish to have it overnight, you will only need to add another £20. The Peppa Pig Bouncy Castle comes with all the safety instructions as well as with all the necessary equipment to set it up (we’ll be doing that part, don't worry). All you have to do is call us, email us, or use the contact form, and give us your details.